‘US will always remain beacon for freedom, opportunity’. 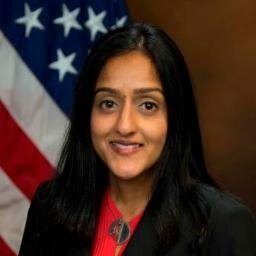 Vanita Gupta, head of the civil rights division, Justice Department, assured in a talk in New Jersey, on Tuesday, the United States would continue vigorous enforcement measures against religious discrimination and bullying in schools, especially against Muslims and people of Arab or South Asian descent and people perceived to be members of these groups. “Tolerance can overcome bigotry. Empathy can extinguish hate. And diversity can defeat discrimination,” said Gupta, delivering remarks at the Interagency Roundtable on Religious Discrimination in Education, in Newark, NJ. Gupta spoke of the discriminatory backlash against Muslim students and students perceived as Muslim, in the wake of several terrorist attacks, notably in Paris, France and San Bernardino, California. She said that enforcement agencies in the country are striving hard to counter it and to ensure a civil society free of strife. “Religious discrimination against one student not only harms her and her family. It harms all of us. It violates the defining values of our democracy. And it threatens the foundation of a free and open society,” said Gupta. “Good afternoon. Thank you, Melissa [Rogers], for your kind words and for your innovative leadership at the White House Office of Faith-based and Neighborhood Partnerships. I also want to thank U.S. Attorney Paul Fishman [of the District of New Jersey], for his help in organizing today’s discussion and for his outstanding service to the people of New Jersey. And I want to acknowledge my colleagues from across the administration – including from the Justice Department’s Community Relations Service, the Department of Education and the White House Initiative on Asian Americans and Pacific Islanders. It’s a pleasure to join you all for this inaugural roundtable as we launch our new interagency initiative to combat religious discrimination. Our discussion today – and the discussions we’ll lead around the country in the months ahead – will help us address the tough questions facing our communities. How can we combat religious discrimination? How can we promote religious pluralism? And how can we create safe, supportive and inclusive schools for all our children? Throughout the world, America shines as a beacon of freedom and opportunity. We welcome people from every creed and walk of life to our shores. And we believe in a set of simple truths. Tolerance can overcome bigotry. Empathy can extinguish hate. And diversity can defeat discrimination. From the 18th century – when George Washington reassured Jewish Americans that our government “gives to bigotry no sanction” – to the days after 9/11, when George W. Bush reassured Muslim Americans that our country respects and protects people of every faith, our leaders have vigorously defended religious freedom and religious pluralism. These ideals define the story and spirit of America. Regrettably, our country has not always lived up to the promise of its founding ideals. Even today, too many people continue to suffer discrimination, harassment and violence simply because of their religious beliefs. Following heinous acts of terrorism in particular, too many Muslim Americans – and those perceived as Muslim – suffer a backlash of violence and discrimination. We saw it after 9/11. And we continue to see it today following the tragic events in San Bernardino, California, and Paris. We see criminal threats against mosques; harassment in schools; and even reports of violence targeting Muslim Americans, people of Arab or South Asian descent and people perceived to be members of these groups. But we also know that religious discrimination appears in many forms and targets many communities. In the Civil Rights Division, we continue to respond with a range of robust enforcement efforts. We prosecute religion-based hate crimes. We address unlawful barriers to building places of worship. And we combat religious discrimination, including harassment, in education and employment. Working with our U.S. Attorney colleagues, the Civil Rights Division has taken action around the country to ensure that all students can attend school free from discrimination, harassment and violence. In part because of our efforts, today, Christian students in Bakersfield City, California, can observe Ash Wednesday without fearing an unexcused absence. Muslim students in Lewisville, Texas, can pray together during lunch. Jewish students in Pine Bush, New York, can walk the halls, ride the bus and sit in class without enduring anti-Semitic bullying and intimidation. Arabic-speaking EL students in Dearborn Heights, Michigan, can learn from qualified teachers. And Sikh students in DeKalb County, Georgia, can wear a turban to school without facing harassment. Of course, we also recognize the urgent work ahead. As U.S. Attorney Fishman just highlighted, today the Civil Rights Division’s Educational Opportunities Section is launching a new enforcement initiative with the U.S. Attorneys’ Offices to amplify our efforts to combat religious discrimination in schools and other educational settings. This initiative will allow us to expand our ability to investigate and remedy complaints; to lead robust community outreach; and to develop critical guidance for federal prosecutors. And as we launch this new initiative, U.S. Attorney Fishman and his office will continue to serve as close allies and critical partners. In addition, the division will continue to work with Deputy Assistant Secretary [Robert] Kim and our colleagues at the Department of Education to expand access to federal resources for diverse religious and ethnic communities by translating information about the different types of discrimination we address. These efforts will help us combat discriminatory backlash against Muslim students and students perceived as Muslim. But they will also benefit children of every background and every religion. Because make no mistake. Religious discrimination against one student not only harms her and her family. It harms all of us. It violates the defining values of our democracy. And it threatens the foundation of a free and open society. What about the religious discrimination coming out of the White House?